In the first post of the sulforaphane series, we covered that consuming sulforaphane can lower inflammation. Now let’s talk about why eating tons of cooked broccoli may have zero effect. Ok, so I told a white lie in the first post: Cruciferous vegetables such as broccoli, cauliflower and cabbage don’t contain actual sulforaphane. What they do contain however is the precursor of sulphoraphane. It’s called glucoraphanin, and it accumulates in the vegetable’s florets and leaves. Only on consumption does it turn into sulforaphane. This requires the help of the enzyme myrosinase. This enzyme is turned on when the raw vegetable is crushed, chopped or chewed. It is usually delivered with the vegetable but unfortunately is often denatured when cooked. When an enzyme is denatured, it can no longer do its job because it has lost its structure. Think of a paperclip that is bent open. You can still say it is a paperclip, but it can no longer perform the function of holding papers together. That’s what happens to enzymes when they become denatured. 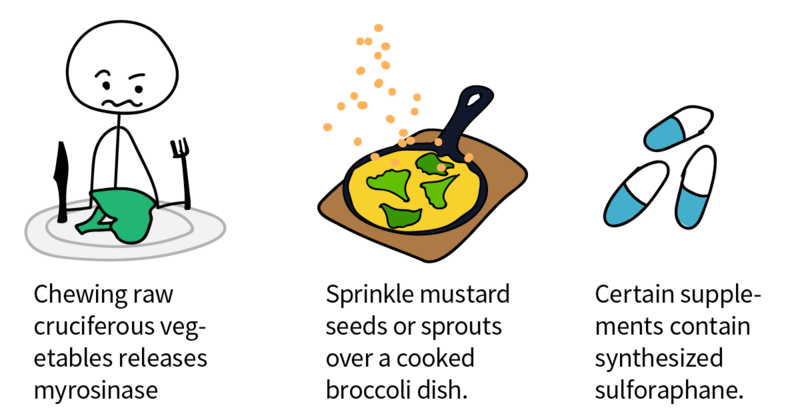 Simply sprinkle some broccoli sprouts, mustard seeds, horseradish, daikon or wasabi over your cooked vegetables. These have so much myrosinase that they manage to turn most of the glucoraphanin in your cooked cruciferous vegetables into sulforaphane. There are some supplements that have synthesized sulforaphane, but these are not very stable and should be refrigerated. There are two on the market that have been investigated in the scientific community. Note, we’re not affiliated with either of them. One is a stabilized form of sulforaphane called Prostaphane containing the equivalent of 100 g of raw broccoli per tablet. It needs to be refrigerated at all times and is only available in France and neighboring countries at the moment.3 The other contains glucoraphanin and myrosinase and is called Avmacol, unfortunately it’s currently not available outside the US. In order to understand how sulforaphane actually works once we have it in our bodies, we need to take a short trip down its biochemical pathway. Sulforaphane can activate the transcription factor Nrf2. A transcription factor is something that can influence which genes are transcribed from DNA into messenger RNA, called mRNA. mRNA moves out of the nucleus and can be translated into proteins. If none of that makes sense to you, simply remember this: Normally, Nrf2 is turned on every 129 minutes, but when stimulated by sulforaphane it is activated every 80 minutes.6 This means you are supercharging your Nrf2 pathway when you consume sulforaphane. Adding glucoraphanin to your diet and combining it with myrosinase gives your cells access to all the super powers of sulforaphane. How do you sprout broccoli yourself? And how much sulforaphane should you consume? We’ll talk all about that in part 3 of the sulforaphane series.